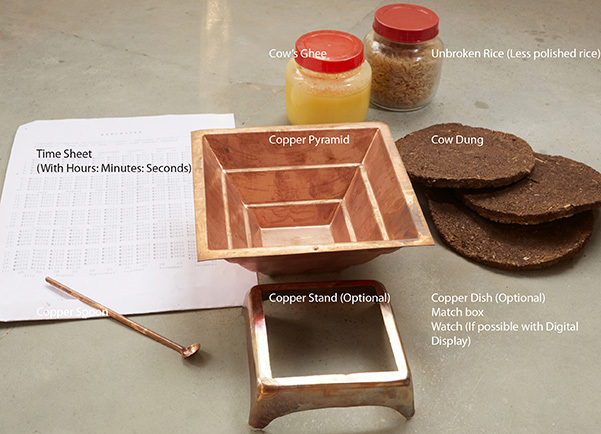 For Agnihotra you require a copper pyramid of specific size and shape. Copper is a conductor. Just at morning Agnihotra all the electricities, energies, ethers are attracted to the pyramid in its shape. At sunset these energies are thrust out in same shape. Preferably, brown rice. Highly polished rice loses nutritional value and hence, brown rice. Only unbroken pieces of rice should be used for Agnihotra. If rice is broken the subtle energy structure is disturbed and hence, is not fit for Agnihotra healing fire. Take some butter from cow’s milk which has no additives and is pure. Heat it on low heat. After white solids have risen to the top pass the liquid through a fine strainer. What passes through is clarified butter (Ghee). This can last without refrigeration for a long time. Ghee is a very special medicinal substance. When used in Agnihotra fire it acts as a carrier agent for subtle energies. Powerful energy is locked up in this material. Take dung from male or female progeny of a cow. Make pancake-like patties and dry them in the sun. Agnihotra fire is to be prepared from this dried cow dung.Cow dung is treated as medicine in all ancient cultures whether they be Indians of North or South America, Scandinavians, East or West Europeans, Africans Asians. Agnihotra has to be performed exactly at sunrise and sunset based on the definition given in the Vedas. 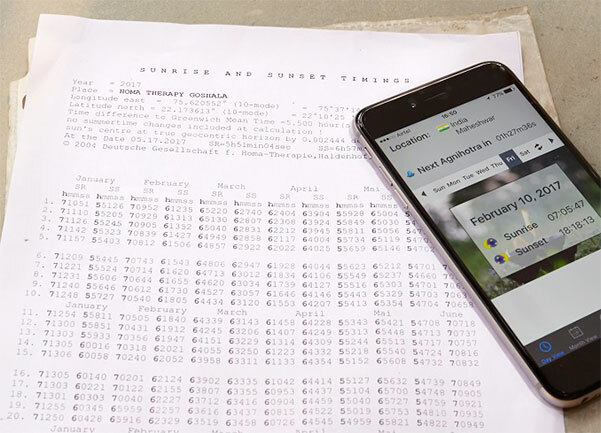 Due to the technological evolution, at present we can find out the exact timings of the desired place using latitude, longitude and time zone. And it is so exact, that we can get the timings in hours, minutes and seconds. One can also use Agnihotra application with seconds’ accuracy for their Smartphones or Tablets.